Anyone who's used a knitting loom knows that they are great for making hats and scarves, but there's a lot more to them than that. Although looms lend themselves to somewhat simpler knitted pieces than hand knitting because your shaping options are somewhat limited, the various ways you can fit individual pieces together is almost endless. The looms' shapes invite the sort of creativity that an ordinary pair of knitting needles might not always spur. Knit with a bulky-weight yarn, this stretchable accordion cozy turns an ordinary Mason jar into an eye-catching vase with a pleasantly soft texture. Download a printable copy of the pattern, complete with photos, below. Cast on with a single round of e-wraps. Work single knit stitch for 1 round. Work single purl stitch for 3 rounds. Work single knit stitch for 3 rounds. Continue alternating 3 rounds of purl stitch with 3 rounds of knit stitch until the cozy is as long as you want it, ending with 3 rounds of purl stitch. Because the jar fits through the center of the loom, you can try it on periodically to gauge the cozy's length. Work one more round of knit stitches. Cast off using the single crochet method. (Slip the first loop onto your crochet hook, then the second; yarn over with the working yarn and pull it through both loops on the hook. This completes a single crochet stitch. Then *slide the next loop off the loom and onto your crochet hook, yarn over, and pull through, completing another single crochet stitch. Repeat from * until you've cast off every stitch and have just one loop left on your crochet hook. Snip the working yarn, leaving a 6- to 8-inch tail, and pull this through the loop.) Note: If you're covering a quart-size or larger jar, add a chain stitch between every single crochet stitch. 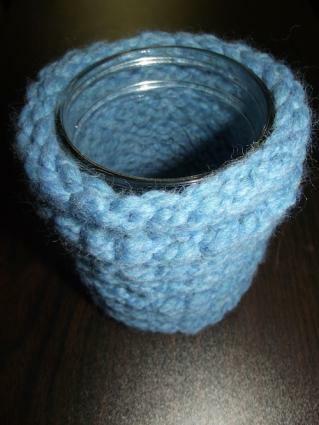 Download the printable pattern for this cute jar cozy. There are plenty of other items you can create with a set of knitting looms. Try some of these sites for more free patterns. Bev's Country Cottage has a great collection of free loom knitting patterns, both original to her site and from around the web. Most of these are patterns for babies and toy making, but there's nothing wrong with starting small, and these projects provide near-instant gratification. 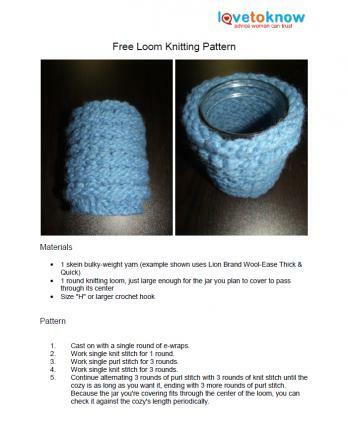 When you register on the Lion Brand Yarn website you'll receive access to more than 1,200 free patterns, including free loom knitting patterns. Free podcasts are also available to help you improve your loom knitting skills. The Knifty Knitter Blogspot offers patterns to match each type/size of loom the company makes. Projects include scarves, slippers, bags, baby blankets and more. Knitting Pattern Central may have the single most extensive collection of loom knitting patterns you'll ever find. You have to click each individual link to see an image of the finished product, and some of the linked sites might require you to sign up for a free account before you can view the pattern. But if you spend long enough searching this site, you're guaranteed to find something that suits your wants and skill level. Loom knitting isn't for everyone, but those who struggle with maneuvering two needles for hand-knitting might find that the loom's simplicity appeals. It's also a good way of teaching kids to knit, and excels at certain things that even the best hand-knitter can't do. For example, when you knit rings of ribbing (as for the accordion cozy pattern above), the "jogs" that develop when you start each new round are less obvious on a knitting loom than they'd be when done by hand. Even if you don't use your knitting loom for everything, you may find that you prefer it to knitting needles for some things, like knitting sleeves or socks. You'll never know what it can do for you until you try!